Les Calladine started work at Ilkeston Mines Rescue Station on Monday 24th October 1938 on 3 months probation. He had free rent, coal and lighting together with £2.16/- a week, but he had to give his boss 10/- for shoes. On passing his probation period Les received an extra 15/- a week. 'You have our gratitude' NCB official tells rescue workers. Presentation Of Long Service Awards. YOUR work commands the respect and the gratitude of all of us in this industry, from the Divisional Board to the newest recruit," said Mr. R. V. Edwards, Finance Director to the East Midlands Division of the National Coal Board. Charles Snarski - Ilkeston Mines Rescue Brigadesman. All men working in or under the Brigade are to conform Strictly to the Rules and Regulations which may from time to time be issued by the General Manager. 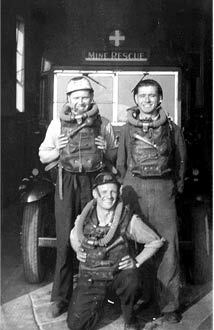 MINES rescue workers attached to Ilkeston Mines Rescue Station from collieries in No. 5 and 6 Area of the East Midlands Division of the N.C.B. heard cheering news on Friday night from Mr. N. Fricker, O.B.E., Divisional Marketing Director. "Things are brighter-much brighter," he told them. Percy's monkey business might have had a more tragic ending if it had not been for Phil Healey, who pulled him down from a rooftop in Manor Road. For the l2th time in 30 years the Ilkeston Rescue Station won the Wynne Billiards Shield for East Midland Division Stations of the National Coal Board, this year, and formally received it at a tea and social at the Mines Rescue Station, Manners-road, last week. Wages What did living in a mines rescue family mean, financially?